Wired showcase in a 6 mm curved glass with three 8 mm fixed glass shelves. Shelf supports in glass welded to the showcase. 10 mm glass top and base in matt black lacquered wood. Profiles and feet in matt black lacquered aluminium. Door with lock. 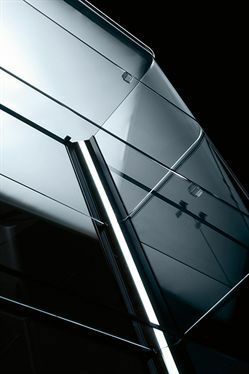 LED lighting positioned in the aluminium profiles.